Deliver quality care that satisfies patients’ end-of-life care planning preferences. When the time comes to receive hospice care, patients want assurances that their treatment preferences will be honored. And at this time in their lives, they want one less thing to worry about. The issue when dealing with hospice care and end of life care planning is that a patient may not always be able to make his or her care requests known, as a result of the effects of their illness or condition. Plus, if multiple end-of-life care givers are involved, there could be competing types of care offered, often without patient input beforehand. Such a situation can lead to unwanted or unnecessary treatments that the patient didn’t request. Care Directives’ Advance Directive Information Exchange (ADiE) records patients’ treatment preferences for their end of life care planning, so they can make their desires known to hospices. 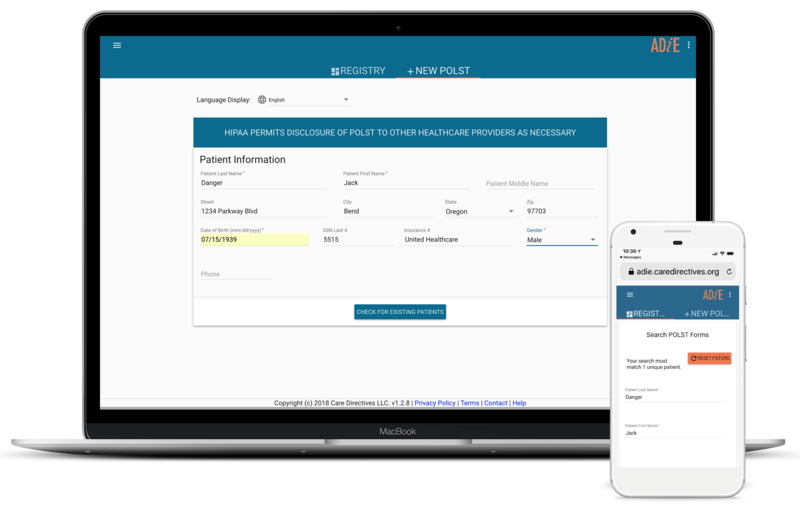 Hence, using ADiE, hospices, and end-of-life caregivers gain access to advance care planning documents, such as POLST/MOLST forms, Advance Directive, online medical directive, legal directives, and related documents. These records are served up in real-time in a hospice’s caregivers existing workflows, so patients receive the care they requested. Patients will now have more of a say over their treatment by recording their preferences beforehand.